So I have this giant tree in my back yard. It wasn't looking too healthy, so I had this guy come over and cut it down. I thought to myself, "Great. This works out good for me, I have a fireplace in my new house, I ought to be able to use all of this wood. No need to have it hauled off. I will just split it, stack it, and this winter, life will be golden." So, today I went off and with a little bit of my birthday money and my handy-dandy Lowe's card, I purchased some of the tools that I thought I would need to start splitting this wood. 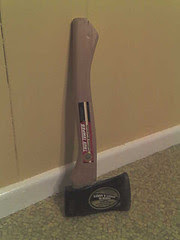 One of the tools that I purchased was a small one-handed hatchet. Once I got home, I immediately set to work on the wood. I was feeling pretty manly and all, I was splitting wood with my axe, I had a fire going in the fire pit, I was profusely sweating, and drinking a (non-diet) coke. Oh yeah... A real man. My sons watched me splinter through a couple of logs as if I had been doing this my whole life, but they weren't as impressed or as interested as I thought they would be. My 4-year old immediately went off to look at bugs or something, but the 8-year old spyed the little hatchet. Ok. So giving a hatchet to an 8-year old is never a good idea, no matter how manly you are feeling. Don't worry. The injury was minor, it only required a trip to an urgent care clinic and some stitches. That isn't that big of a deal, right? I mean, every kid has to stick a hatchet in his big toe at least once in his lifetime. Sam just got it out of the way early. I have to say, he was very brave through the whole process. Mommy wasn't there to be with him (...which, her being out of town, might have something to do with how we got ourselves into this mess to begin with...), but he took it like a man. The only time he started to cry was when they gave him the shot to numb it. He is a tough kid when he needs to be. Right now I think that he is actually enjoying the attention that he is getting. He is all propped up on the couch, watching a movie and eating Double Stuff Oreos with some milk. His official new nickname is hatchet-boy. At least that is what he will be called until he becomes hammer-boy or bike-wreck-boy. my question for samuel is, what were you trying to hit?? Thank you, thank you thank you thank you thank you thank you for NOT posting the pictures where I would have to see them! Sam, Peyton and Paige are very concerned about you! Your Daddy is never going to let your Mommy come and see me again if you have to go to get stitches when she is gone! I knew I should have posted the pictures for all to see! Tell Peyton and Paige we said HI. Tell them that Sam is OK, in fact I think that he is milking this injury for all that its worth. They used to call me "Weed-eater Boy". Bad, bad memories. Um...it's MY hope that he will become "NASA boy" or "Prom King boy"...."Lego boy"?... "Doing the dinner dishes Boy"
Poor, poor Sam...so far I've resisted the urge to look at the ickiness! Hope it heals soon - it'll make a great story later Sam Man! Weed-eater boy... I like that. Yow! 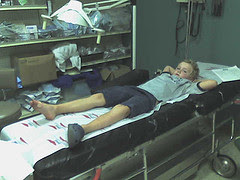 My brother chopped the side of his foot when he was thirteen. Ruined a perfectly good pair of rubber boots too.